It's not just cake, it's dessert! Welcome to Sweet Cakes! Are you looking for a wedding cake or for an occasion? Our cakes are custom made and designed to fit you. 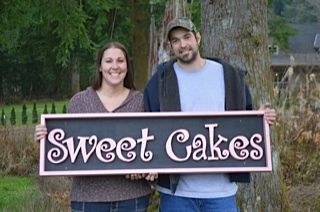 When coming to Sweet Cakes you can get a cake that will be sure to be a memorable part of your special day! We hope our website is helpful to you. We do cakes for all different kinds of occasions. All of our cakes are made from scratch using the best ingredients. All real stuff! Our cakes are always fresh and moist. Cake is what makes the day special whatever you are celebrating, birthday, baby shower, wedding, bridal shower, anniversary, holidays, or just having a special dinner with special people. When you have a piece of our cake, we are sure that you will want a second piece. So take a look. Give us a call and we can talk about the cake that is on your mind. We here at Sweet Cakes strongly believe that when a man and woman come together to be joined as one, it is truly one of the most special days of their lives, we feel truely honored when we are chosen to do the cake for your special day.